NCI jet pumps for gases can use Steam, Air or Liquid as the operating medium. Typical applications include: (A) Jet Pumps for gases (Exhausting): This application involves removing gases at a continuous rate from an area while maintaining the pressure at a stable level. These applications often involve removing gases or fumes that are continuously recurring. An example would be removing smoke from a welding or machining area. This process also could be used for injecting oxygen into a liquid stream. If the gases being removed have undesirable characteristics, it is possible in some cases to neutralize them by using a reactive motive fluid. (B) Jet Pumps for gases (Evacuation): This application involves pulling gases (using jet pumps) from a defined volume by pumping the tank down from a starting pressure to a final lower pressure. It is generally sized by determining the amount of time it takes to reduce the pressure in the vessel to the desired final pressure. Examples of this application would be reducing the pressure in a reaction vessel to purge it of detrimental gases, or removing steam from a vessel before opening it to increase operator safety. 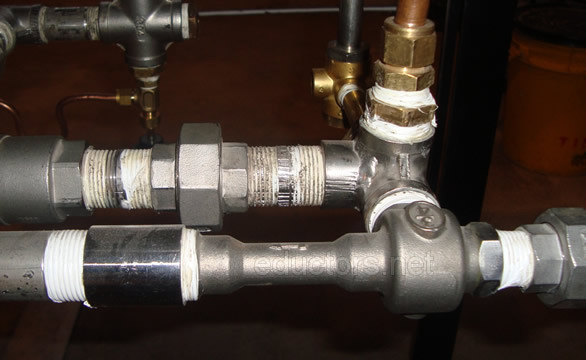 A variation of this type of application is the use of eductors to prime piping or a system with liquid. Priming evacuations may be used to bring the level of liquid up to pump level to avoid the pump being started dry or to establish a siphon. NCI jet pumps (eductors) operate on the basic principles of flow dynamics. This involves taking a high pressure motive stream and accelerating it through a tapered nozzle to increase the velocity of the fluid. Gas Motives are compressible fluids and are put through a converging-diverging nozzle. The gas can exceed the speed of sound. This fluid is then carried on through a secondary chamber where the friction between the molecules of it and a secondary gas (generally referred to as the suction fluid) causes this secondary gas to be pumped. These fluids are intimately mixed together and discharged from the eductor. NCI (uniquely) has more than 50 years of experience with jet pumps and in tank mixing applications. Our tank mixing experience covers both tank mixing eductors and propeller type side entry mixers involving tanks in sizes up to one million barrel (42 million gallons) capacity. related: how does an eductor work? There are three connections common to all NCI jet pumps (venturi eductors). MOTIVE Connection: This connection is where the power for the eductor is generated, by increasing the velocity of the motive fluid. The eductor nozzle in this section takes advantage of the physical properties of the motive fluid. Eductors with liquid motives use a converging nozzle as liquids are not generally compressible. 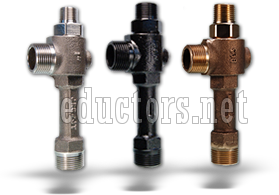 Eductors with gas motives utilize converging-diverging nozzles to achieve maximum benefit from the compressibility of the gas. All nozzles for eductors have smooth flow paths. Flow paths with sudden steps or roughness on these high velocity surfaces cause jet pumps to operate less efficiently. Total customer satisfaction comes from the combination of quality products purchased at a reasonable price and delivery quickly and when promised. Jet Pumps are in stock from 1/2″ up to 3″ sizes. Jet Pumps are stocked in Carbon Steel, 316SS and Bronze. Tanks Eductors are stocked in sizes from 3/8″ up to 3″ in both Carbon Steel and 316SS. We also stock tank eductors in both Polypropylene & PVDF (KYNAR) materials in sizes from 1/4″ thru 1-1/2″.